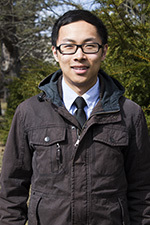 SBE student Jinlun Bai came to the University of Maine from China four years ago, and he is very happy he did. He is using a full international Student Tuition Scholarship to pursue a double degree in Biology and Psychology with a minor in Neuroscience. Jay, as he prefers to be called, is currently conducting his Honors Thesis research project in Dr. Dusty Dowse’s lab, which he will defend in May. His research is exploring the effect of mutations in calcium regulatory proteins on cardiac rhythmicity in Drosophila, fruit flies. 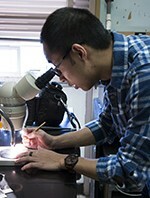 His project involves a variety of techniques including culture maintenance, fly heartbeat monitoring using microscope-phototransistor system, RNAi, and cardiac rhythmicity data analysis. Jay is a high achieving academic student in the School of Biology & Ecology, and has received a wide range of awards throughout his time at UMaine including highest GPA for a third year student in the School of Biology & Ecology. Recently, he was awarded the INBRE Functional Genomics Fellowship, an extremely competitive fellowship awarded to a forth year Honors student working on a thesis related to biomedical research in comparative functional genomics. In May, Jay will be defending his Honors Thesis and is currently deciphering what his academic future has in store for him. He is in the process of applying to graduate schools around the country, where he hopes to study molecular biology or stem cell research. Both topics of interest are related to the research he has been conducting. “I just find those topics fascinating…there is a huge world out there” Jay explained with a spark of excitement in his eyes. After scrolling though the faculty profiles on the SBE website, Jay became interested in Dr. Dusty Dowse’s lab and his research on cardiac rhythmicity. He became a volunteer during the summer after his freshmen year at UMaine, and has continued to conduct research there for the past two years. Dr. Dowse has had the pleasure of working with Jay for three and a half years now, and during this time was able to see Jay transform from a volunteer in his lab, to an independent researcher. “Jay has gone from saying, “How do I do this?” to “Why am I doing this?” Jay has taken an active role in planning his project and doing the background research. He has become more of a leader in his own research” says Dowse. Working in a lab is a great way for students to gain hands on experience and prepare themselves for their future careers. It also gives students the opportunity to form a connection with their professors, which is often difficult due to class size. “A lot of the science classes are really big, so it’s hard to have a more personal interaction with your professor. But working in the lab you get to know the professor better, and they get to know you better. Whenever I have questions, I can bring it to Dusty. I believe that personal interactions are very important for academic achievement,” explains Jay. Dr. Dowse had similar advice to give to undergraduate students hoping to enhance their undergraduate academic experience. Congratulations to Jinlun Bai on his academic excellence, and we wish him the best of luck with the remainder of his time at the University of Maine.